I’ll know more about how long I will be in Houston a little later in the year as I need to figure out when I’m going to get there. 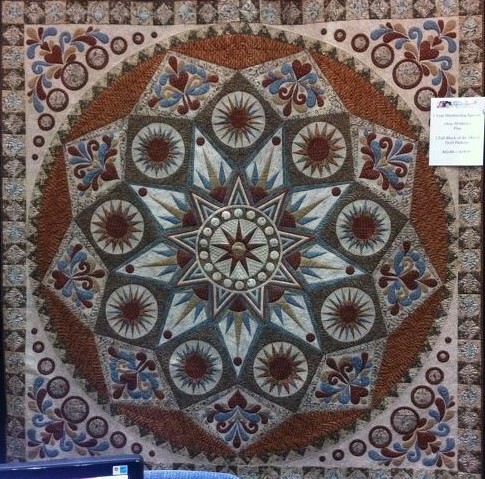 I want to have time to see the show and visit with friends from The Quilt Show and other places. I hope to meet you there! Teri: Hi Lisa! Thanks for working through the interview process with me. 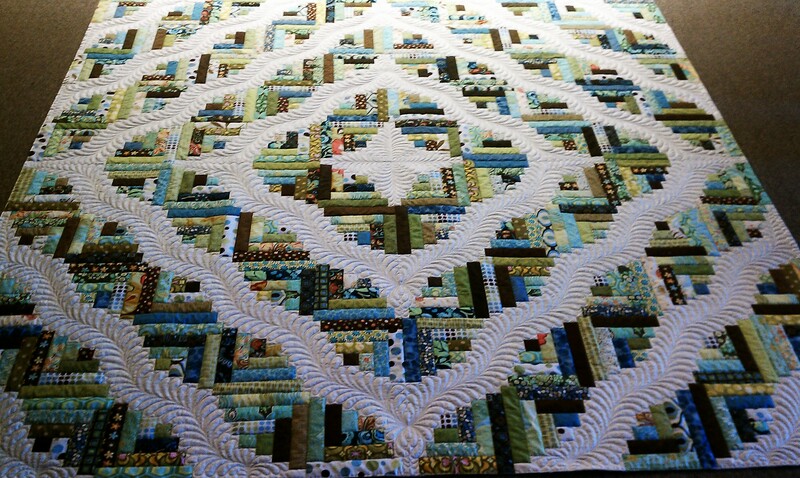 Would you share about how long you’ve been quilting and how you got started? Lisa: Three years and three months! That’s sort of a long story, but a short story. I have worked nearly every type of job one can imagine. At the time I was office manager for an office supply distribution company. I was B-O-R-E-D. Most of my (semi) adult life had been spent cooped up in an office where I had to take out all of my piercings and have no visible tattoos. I’d never really done anything creative other than my writing, so when my mom suggested that I give quilting a shot I thought she was absolutely insane. 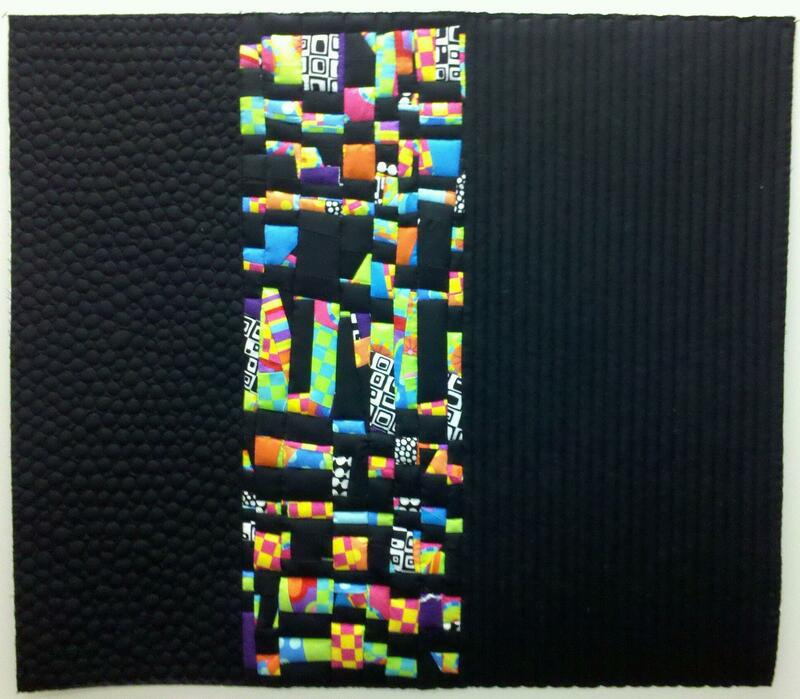 I didn’t know a single thing about quilting, but I gave the longarm a shot, and I liked it. Two months later I had already quilted at least 25 quilts, and I started piecing my first quilt top. Teri: With so many longarm quilting machines on the market how did you come to choose Gammill? Lisa: I have driven basically every machine out there. I don’t want to bad mouth any other brands, but there were some very obvious advantages to the Gammill versus other machines. I really like the APQS machines too, but I had a hard time with the “ergonomic” handles on them. The Gammill is like the Bentley of quilting machines. Their customer service is second to none. They glide smoothly, give a beautiful stitch, offer tons of features and options and there is no play in the machine. Play in the head while stitching is one of the main things I noticed in other machines. I love my Gammills! Teri: Lisa, I know you have two longarms can you share a little bit about them and since we’re facebook friends and I saw you go through the process of naming your machines can you share a bit about their names? Lisa: Absolutely. I have a Gammill Optimum, 30″ head on a 14′ table. Her name is Bertha because she’s big and mean and you don’t want to mess with her. Then I also have a Gammill Vision, 22″ head on a 12′ table. His name is Oliver (Ollie for short). I love the name Oliver and also Karen Marchetti’s owl quilt, which is also named Oliver. It’s just a cute name. Since he is smaller and cuter than his big sister, it seemed perfect. Teri: What are your favorite patterns & colors? Lisa: I don’t really have a favorite pattern, because I haven’t created it yet. I’m really liking paper piecing lately. I want to create something completely off the wall and fabulous in the near future. My favorite color is pink, but I love all of the bright colors. I’m not really one for dull or subdued. I can certainly appreciate their beauty, but I’m drawn to bright. My favorite backgrounds are grey, white and black, which make the bright colors that I like to use really pop out of the surface. 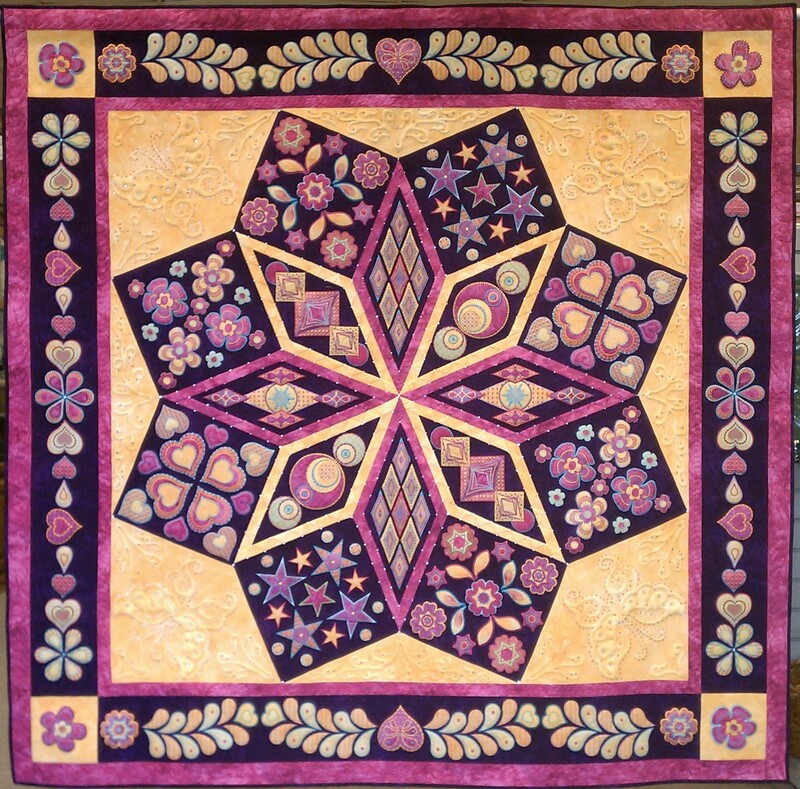 Teri: Do you have a favorite part of the quilting process? Lisa: My favorite part is every part, EXCEPT for the math! I enjoy dreaming things up and piecing, but the actual quilting is the part that I really look forward to. 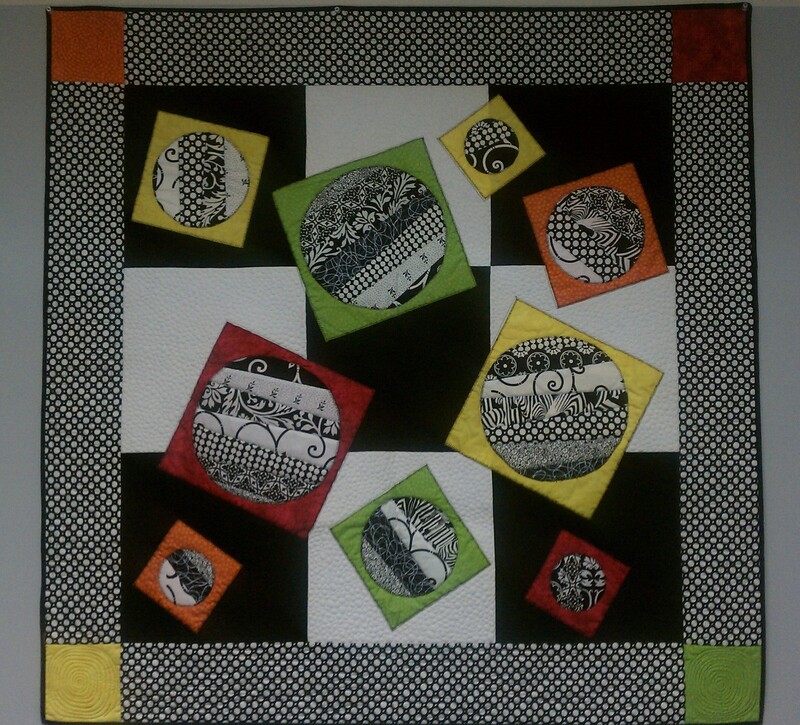 Usually when I make a quilt, I design it around the type of quilting I want to do. My BeDazzled quilt was the exception there, as I had no idea what I was going to do for quilting until the day I loaded it on the frame. And look at it now! Teri: You mentioned that your least favorite part of quilting is the math, a lot of quilters will agree with you! Is this why you prefer paper piecing? Do you think it’s important for quilt makers to use math through the process? Lisa: I like paper piecing because if it’s done PROPERLY, it is the most accurate piecing you’ll ever do. I’m not a huge fan of cutting either, and with paper piecing you can pretty much just chop a bunch of fabric up and not worry about how accurate you are as long as it covers what it’s supposed to. As far as the importance of math, that depends entirely upon what type of project you’re doing. If you use Rayna Gillman’s technique of creating a free-form quilt (and I highly suggest that you do), you don’t have to worry about math, or much of anything. However if you’re doing traditional piecing and want your quilt to look nice, then yes. Math is probably the single-most important part of the process. 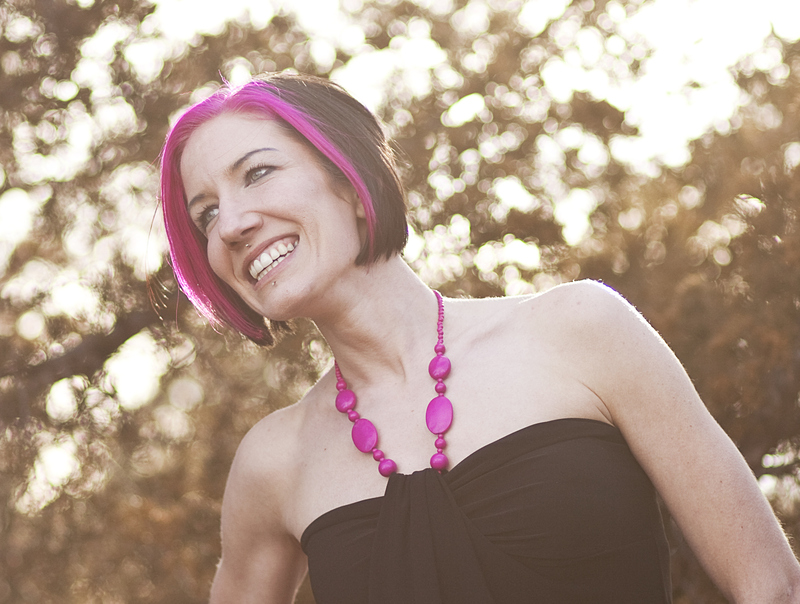 Teri: Do you have a blog or website that you’d like to share? Great interview! Thanks for doing this! Congrats on Houston!!! And that was great interview….